Dr. Abraham Mar Paulose celebrated Holy Communion at the Annanagar Mar Thoma Church yesterday, Sunday 20th July. It was his first visit to the parish after his consecration as a bishop in 2005. As the youngest bishop of the Church, he expressed his concern for the place of children in the Church. He lamented that it has been the Sunday School which is often canceled when a special function happens in a Church. As the General Secretary of the Mar Thoma Sunday School Samajam, then priest Rev. Dr. K U. Abraham, he has made significant contributions to the children's ministry. The Children's Maramon which he organized in 2005 became a land mark in the history of the Sunday school, which attracted almost a lakh of children. In his sermon he challenged the members to go beyond the traditional concepts of ministry. He pointed out that the programmes and projects of the Church are not the ministry. Those are only some expressions of the ministry of love. The meaning and success of a project is not how effieciently it was executed, but with what purpose and concern it was organized. He has also referred to the recent tension between the church and state in Kerala. The churches need to rethink its mission and ministerial function in the light of the criticisms raised against the schools and colleges run by them. Accumulating and preserving power and property are not the mission of the Church, rather risking them for the sake of Christ. 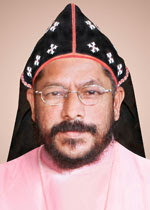 Bishop is a well groomed speaker, who has been trained by the Balajana Sakhyam, the most influential secular organization for children in Kerala. Also he was actively involved in student union activities at the university level, now having very high ranking politicians of Kerala as his friends. Even as a bishop he boldly expresses his opinion on the political and social issues in society. His leadership qualities will certainly help the church in the contemporary period to give effective leadership in the ecumenical circles. We wish him all the best in his new endeavors to make the Church meaningful and effective.